Summer is in full swing here at b9 architects, which means we are getting ready to host our second Pioneer Square First Thursday Artwalk this summer! 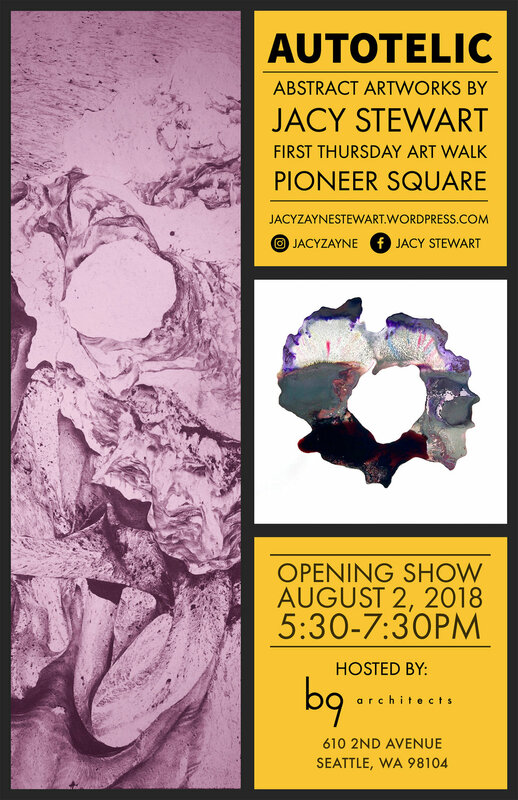 We are excited to welcome local artist Jacy Stewart to display his abstract artwork in our storefront space for an exhibition entitled Autotelic. Please join us for the opening show of Autotelic at b9 architects on Thursday, August 2nd from 5:30-7:30 PM. Light refreshments and bites will be provided. We hope to see you there! Jacy Stewart uses water as a base wherein traditional fabric dyeing materials interact. Spontaneous in nature, each work is a unique reaction of color, texture, and form. Part chemistry, the reactions presented are found throughexperimentation, trial and error. Working in multiples Jacy seeks well balanced compositions, interactive colors, and variable dimensions. Pushing the boundries of 2-D art his work transforms paper into petri dish, visual portals through which new abstracted worlds may form. Jacy correlates his work to jazz music, viewing the materials and colors as instruments engaged in conversation with one another. Every piece then holds its own improvisational tone, finding specific rhythms, waves, and patterns. Strong lines and clear negative space are a natural byproduct of drawing with water giving his pieces a Rorschach quality through abstraction.